Off-site, Mawgan Porth beach is a short, flat, gentle stroll away, with surf schools, shops and restaurants. Further afield you’ll find more coastline, adventure activities, shops, restaurants and pleasantly old-fashioned fishing villages. Cornwall is also globally-celebrated for arts, culture, history, heritage, gardens, food, drink, film, TV and literature, with plenty of exceptional family attractions too. 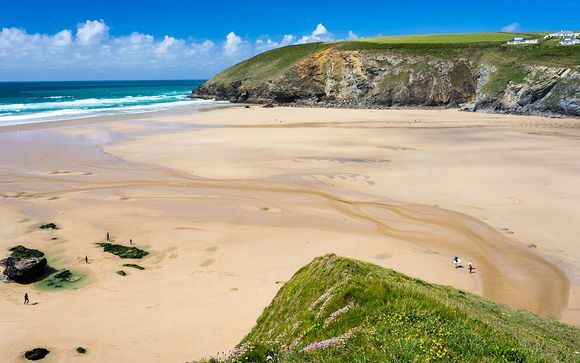 Beaches In the local area, Watergate Bay and the surf beaches of Newquay lie within five miles along the coast road southwards, and the seven bays and beaches of St Merryn and Padstow are 10 miles to the north. 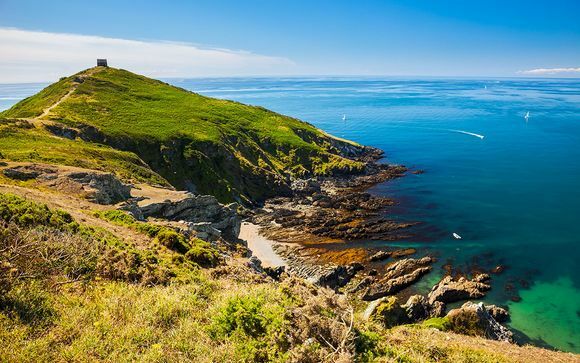 Further afield, the beaches of Marazion, St Ives, Sennen, Kynance Cove, Falmouth, Perranporth and Porthcurno are among the top ten in the county (according to the Cornwall Guide). But Cornish beaches aren’t just for the summer. If it turns nasty outside, do what the locals do: wrap up warm, take a brisk walk in the wind and watch the waves crash on the rocks; let the Cornish sea air blow the cobwebs away while you build up a hearty appetite! 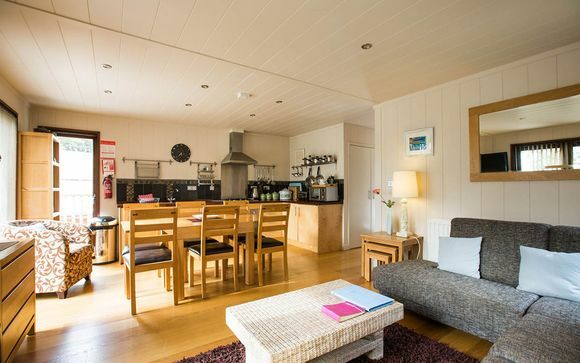 Morlader is a sleek and modern lodge, offering guests both style and comfort, including many features, from the use of sustainable materials in its construction to solar thermal hot water heating. 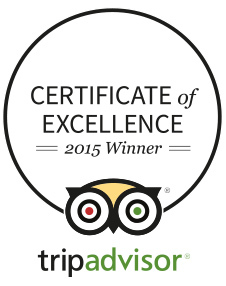 There’s full central heating and a wood burner for those cosy nights by the fire. 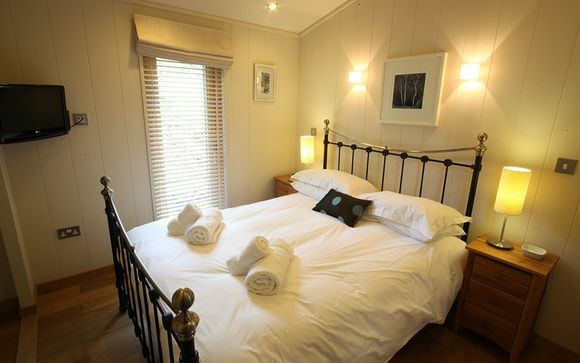 Its three bedrooms sleep a maximum of six (one king with en-suite shower room, one double bedroom, plus one twin room). Other features include a light and airy open plan kitchen, dining and lounge area, including comfy sofas, a flat screen TV with Freeview and DVD player. Outside is a large private balcony with wrap-around decked area. Use your fully equipped, modern kitchen to craft delicious meals with your family and friends. Alternatively, you can head to The Park Kitchen, open for breakfast, lunch and dinner. At the heart of The Park lies a philosophy of authentic sustainability. Many of the herbs used in the food at The Kitchen are grown on-site, and, while you may have travelled from afar, they make sure your ingredients haven’t, wherever possible. The Kitchen also serves snacks and drinks, and look after the little ones too, with a kids’ menu full of tasty, healthy family favourites. Dogs are also welcome in the conservatory and the outside terrace area overlooking the valley. The Park isn’t about organised fun, but they have laid on a few of the essential ingredients to help you design your own adventure and create lasting memories in Cornwall. You can float in one of the two swimming pools, let off steam in the sauna or lounge in the café. There’s also a children’s play area, table tennis and DVD library along with secret suntraps, hidden pathways and fruit and herb gardens which you are invited to sample. Next to the Kitchen is a heated indoor pool, sauna and steam room. Outside, you’ll find another heated pool in a south-facing garden setting, overlooking the valley, complete with a bar serving food and drinks throughout the summer. Stroll along north Cornwall’s breath-taking coastal paths, beaches and cliffs. Get out on your bike or seek out historic homes and gardens, there’s plenty to do all within easy reach of The Park. For something more extreme, learn to ride the waves on Mawgan Porth beach, or maybe try Kite Surfing at Watergate Bay, just two miles down the coast.